Yimiton's Blog: Company abandons female student after crushing her leg in an accident. 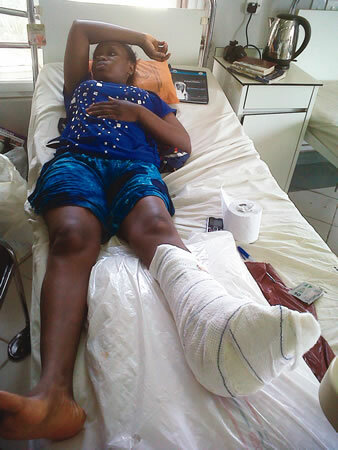 Company abandons female student after crushing her leg in an accident. A father, Kayode Agboola, has cried out for help on her daughter, Abiola, whose leg was crushed by a fuel tanker owned by a company, AbdulKadri and Sons. Abiola was on her way to take the United Tertiary Matriculation Examination on March 24, 2012, when the accident occurred. Agboola said the company reneged on its promise to take care of his daughter’s medical bills. Meanwhile, the company does not have a permanent office in Lagos, but its tankers supply fuel to buyers in Lagos. Abiola, 19, said she was waiting for a bus at Anthony Bus Stop when the incident occurred. “The incident happened around 7am. I was waiting to get a bus to my UTME centre. I stood on a culvert on the side of the road and wanted to cross the road. As I was about to cross, the trailer came from nowhere and crushed my leg. That was the last thing I knew,” she said. Our correspondent learnt that the driver of the trailer immediately sped away. “I don’t know what happened immediately after I was hit but I was told some motorists chased the trailer driver and eventually caught him at Toll Gate area of the Lagos-Ibadan Expressway,” Abiola said. The National Diploma holder from the Lagos State Polytechnic has undergone many surgeries and will soon have another skin graft at the Lagos State University Teaching Hospital, Ikeja. Abiola’s father told Punch correspondent that the driver was caught and taken to the Anthony Police Division. Agboola said, “I went to the police station when I heard that the driver of the tanker had been taken there. But he was later released after he gave his statement. He said after waiting for a while, he called Hassan on the telephone to brief him about his daughter’s condition. Agboola said Hassan informed him that the company belonged to his elder brother and he was still making efforts to get money from the company. Agboola said, “Since then, all I have been getting from Hassan have been mere promises. I was shocked when he told me he paid Mr. Achibong, the Divisional Traffic Officer handling the case at Anthony, N130,000. “Every time I call him, he would promise that they were making plans on the issue but never did anything. It got to a stage that I knew the company did not have the intention of doing anything.